One way to seriously add some drama to your outfit? Throw on a cape blazer. Not only are they mysterious and chic, but they are down right cool. Am I right?! Leather mules, trousers and a black blazer-- the outfit just screams borrowed from the boys. A total switch up from my go-to floral dresses and skirts. I did add in a pink velvet top (dress that is tucked in), and tassel earrings to keep things feeling fun. This past weekend I went on a whirlwind trip to Montreal. But before that, when the weather was seriously pleasant and warm, I headed out with my mom for a quick Sunday afternoon day date. I may still have worn a jacket on top, but the sun was shining which can only mean spring is on its way. I've slowly been incorporating spring pieces into my wardrobe, like this dress that I actually tucked in to act as a shirt. It's super soft, velvety and classic blush, but it's also a mini dress. That wasn't going to stop me from wearing it. There are many ways to play with your spring wardrobe even while it's still cool out. Don't get stuck in wardrobe limbo. Whether you tuck it into your pants, layer a turtleneck underneath, or throw on a pair of tights and over the knee boots, you can dive into your spring wardrobe in winter. What are you doing to break into your spring attire, because I know you are just itching to do it! Let me know. 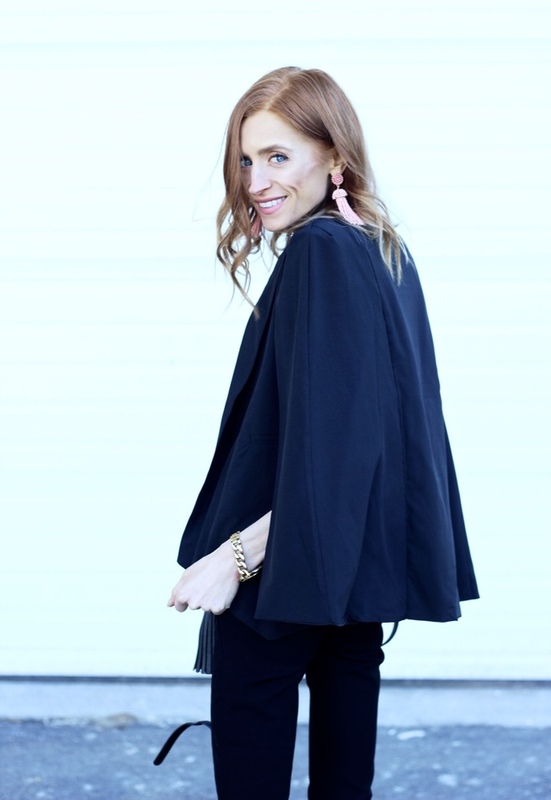 Nothing beats a black blazer and I love that this one is a cape style! It would be a total waste if I buy something expensive and only wear it for a few times.So,after reading your article. I finally made my decision with a white lace pencil dress. You look so fashion. This set is perfection!